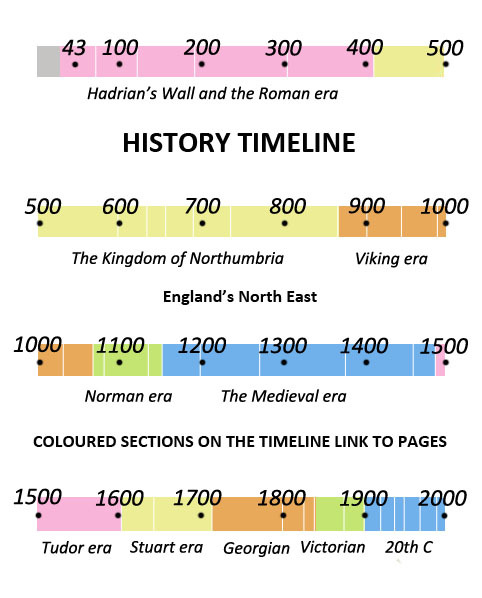 The powers held by the Prince Bishops of Durham in the land between Tyne and Tees were the last vestiges of those once held by the kings and earls of Northumbria. Ultimately the Bishops answered to the kings of England, but their powers in Durham were very similar to those held by the King of England in other parts of the country. Also see the Prince Bishops. 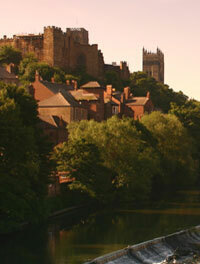 William St Carileph becomes Bishop of Durham. Carileph has not inherited the political powers held by his predecessor which are now held by the Earl of Northumberland. William removes non-celibate monks from Durham and replaces them with celibate monks f rom Jarrow and Wearmouth. The non-celibate monks are moved to sites at Darlington, Norton-on-Tees and St Helen Auckland. England north of the Tees is left out of the Domesday Book, a survey of the king's territory, which is an indication of desolation in the region. Yorkshire is included. King William I dies in Normandy. William Rufus becomes King William IIand rebuilds the New Castle on Tyne. Bishop William of Durham and Robert Mowbray of Northumberland support the claims of the Duke of Normandy, Robert Curthose, to the throne. They join a long list of plotters. Durham castle is besieged by Rufus and Bishop William flees to Normandy. Scots under King Malcolm III invade as far as Chester-le-Street. A Norman fleet of ships is wrecked off Tynemouth during a counter attack. William St Carileph is restored as Bishop of Durham after a three year exile. The king allows Carileph to buy political rights held by Mowbray, the Earl of Northumberland, between the Tyne and the Tees. Only the south Durham district called Sadberge rema ins in Mowbray's Northumberland. As 'Prince Bishop', Carileph can raise armies, appoint sheriffs, administer laws, levy taxes and customs, create fairs and markets, issue charters, salvage shipwrecks, collect revenue from mines, administer forests and mint coins. King Rufus builds a castle at Carlisle. It restricts Scottish invasions along the Tyne Gap and will enable commercial development at Newcastle. Durham Cathedral is started by Bishop William. The old Durham minster is demolished. William is inspired by churches seen in Normandy during exile. The first stones are laid by the Bishop and King Malcolm III of Scotland. Malcolm III, King of the Scots, is slain during a raid on Alnwick. He was tricked by Arkil Morel, nephew of Robert Mowbray. Malcolm is buried at Tynemouth and Mowbray forms an alliance with Donald, the new Scottish king. Bamburgh Castle is besieged by King William II against Robert Mowbray who has rebelled against him. William builds an "evil neighbour" fort - his own fort on the side of someone else's castle - on the walls of Bamburgh and captures Mowbray. Mowbray's cas tles at Newcastle, Tynemouth and Morpeth are seized. Northumberland is taken under direct rule of the King. It stretches from the Tyne to the Tweed but includes land in south Durham. Carileph, Bishop of Durham, dies at Windsor where he was summoned to meet the king on suspicion of revolt. A new appointment is postponed until 1099 when Ranulf Flambard, chief adviser to Rufus, becomes bishop. Flambard has acquired wealth for the king by collecting revenue from postponed appointments and through his tough approach to taxing the barons. Selby-born Henry I becomes King. Bishop Flambard is imprisoned in the Tower of London because the barons tell Henry of his harsh tax-collecting ways. Flambard, who has many enemies, is the first man to be imprisoned here. He later escapes using a rope smuggled in by a butler in a cask of wine and seeks refuge in Normandy. Flambard persuades Robert Curthose, Duke of Normandy, to invade England. King Henry backs down and pardons the duke's allies. Flambard is restored as Bishop of Durham. St Cuthbert's body is buried in Durham Cathedral. It had rested in a nearby chapel while the cathedral was being built. Ten monks inspect the corpse and find that it is incorrupt with a fragrant smell. It may be embalmed. Symeon of Durham, a monk of Durham priory is working on his Libellus De Exordio which tells the history of the community of St. Cuthbert at Durham. A Teesdale castle is built which will later be called Barnard Castle. The forests of Teesdale have belonged to Guy Baliol since 1093. Archbishop Gerard dies in mysterious circumstances. He is thought to have been involved with the occult and is refused burial in the minster. St Godric is granted land for a hermitage at Finchale near Durham by Bishop Flambard. Thurstan, Archbishop of York, is consecrated by the Pope who releases him from obedience to Canterbury. Robert Brus presents a chapel at Middlesbrough to Whitby Abbey. Norham Castle is built on the Tweed by Bishop Flambard. Norhamshire is a part of Durham which neighbours Scotland. Flambard attacks Scotland from this base. Meanwhile Berwick is established as Scotland's first Royal burgh by King Alexander. Turgot, Bishop of St Andrews, retires to Wearmouth after a dispute with the Scottish King Alexander over obedience to the Archbishop of York. David, Earl of Huntingdon, becomes the King of Scotland. He is the son of Malcolm III but was brought up as a Norman in England. Robert De Brus, a Norman landowner at Skelton in Cleveland, is granted land in Scotland by King David. The Pope declares York and Canterbury equal but Canterbury's Archbishop is "papal legate" - the Pope's representative in Britain. Flambard dies after 29 years as bishop. He recently built Durham's Framwellgate Bridge. Durham Cathedral is virtually complete. Meanwhile Carlisle's Augustinian church becomes a cathedral. Ivo de Vesci, a Norman baron, builds a castle at Alnwick. 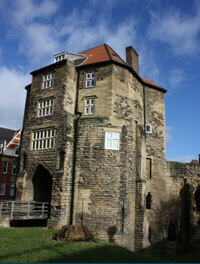 A castle was also recently built at Scarborough by William le Gros. Meanwhile the Manor of Raby recently passed to an Anglo Saxon called Dolphin.